(CNN) - Frequent fliers and potential Democratic presidential candidates - Hillary Clinton and Joe Biden have been touting their travel creds lately as 2016 speculation heats up. Busy at the start of her book tour, Clinton made sure to note in her new memoir the number of miles she logged during her tenure as secretary of state. "I ended up visiting 112 countries and traveling nearly one million miles," Clinton wrote in the author's note for "Hard Choices," which hit bookshelves on Tuesday. Coincidence or not - Biden also made sure the distance he's traveled as vice president was acknowledged at an event on Tuesday. In a speech to a manufacturing summit in the nation's capital, Biden said "I've traveled over 900,000 miles now." "Every single place I go, every world leader with whom I meet; if it's not the first, it's the second or third issues they raise about America's abundance of energy and the prospect that we will be energy independent," the vice president added. Clinton is seen as the prohibitive frontrunner for the Democratic nomination in 2016 - should she decide to run. And polls measuring Democratic support for their party's nomination consistently indicate Biden a very distant second to Clinton. Still, Biden hasn't been shy about possible aspirations for the Oval Office. "There may be reasons I don't run, but there's no obvious reason for me why I think I should not run," Biden said in an interview earlier this year with CNN, during which he said he'll decide on a presidential bid in mid-2015. Clinton said in an interview earlier this week that she would announce her decision on whether she'll run for the White House by early next year. CNN's Dana Davidsen and Steve Brusk contributed to this report. Related: What's not in Hillary Clinton's memoir? WOW! Now travelling around on jets all over the world is somehow a qualification for the presidency... Maybe we should get the airline pilot with the most hours and put them in the Oval office? Sure couldn't do worse than Biden and Clinton!! 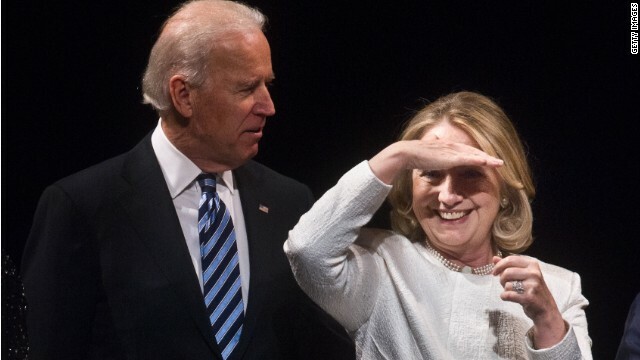 is joe biden looking at hillary clinton's brain injury??? No, he;s admiring her hair plugs. "no obvious reason"??? How about you've run twice and barely got a few percent of the vote! And now you are even nuttier than then so you might not get those votes either. Yesterday's Birther becomes today's Brainer or Benghazer. Such a bitter little person the loser who wrote the above statement is. I pity anyone within a 100 foot radius of Donna when all that hate and ugly comes bursting through to the surface – that venom's gonna leave a mark! With all the volume of hateful comments Donna generates, I might suggest that just as miles traveled alone is not qualification, number of hate words typed does not make a political expert. Oh you poor poor babies.... can't handle a small taste of what you spew in here 7×24? You know there is a saying about heat and kitchens. You might want to look it up. The only question that should be asked (but won't be by CNN) is, What exactly did you accomplish by "..." visiting 112 countries and traveling nearly one million miles," " ???? If the dominate liberal media, especially the NYT (which daily provides marching orders for the majority of Broadcast and Cable news outlets) would treat Mrs. Clinton like a Republican candidate instead of the pre- coronation treatment she is receiving, we might get more than a Book Tour and softball questions. Pitiful duo for the highest office in the land..will someone besides clinton and biden please step up? Maybe the plastic surgeons that they obvioualy emply on a permanent basis!? -no he is looking for JA whether he has any brain at all. Sure we could do worse. We could elect another Bush. George The First gave us one war, George The Second gave us two wars, and what might Jeb bring us? Globaal Annihilation? Have you ever been out side of your bunker ? Really................Silence would do you good.